No. 1 Dartmouth proved why it deserves the top spot Saturday, dominating No. 4 ranked Harvard University 39-10 at Mignone Field. The scoring was distributed across the Big Green lineup, with single tries coming from Camille Johnson ’19, Berit DeGrandpre ’20, Lilly Durbin ’21, Idia Ihensekhien ’21 and Eva Klein ’20. Frankie Sands ’18 stood out from the pack with two tries, while Kat Ramage ’19 had two conversions herself. These scorers and a strong defensive effort led to an early 17-0 start followed by a Crimson try then another 15-0 Big Green run to pave Dartmouth’s road to victory. The Ivy League rivals had entered the game undefeated and each up three spots since the preseason poll. Dartmouth has now knocked off three teams that began the season ranked along with them in the top seven, including Quinnipiac University (1), United States Military Academy (3) and Harvard (7). Next weekend, Dartmouth hosts No. 10 Brown University in its final match of the regular season. Charlie Broom ’20 fell against two of the top singles players in the nation on Thursday and Friday at the Intercollegiate Tennis Association All-America Tournament. Broom drew a tough first-round matchup on Thursday, facing 17th-ranked Timo Stodder of the University of Tennessee. Broom himself came into the match ranked No. 100, though he was defeated 6-3, 6-1. On Friday, Broom squared off against No. 32 Nathan Ponwith from the University of Georgia in the consolation bracket. Broom jumped out to a good start early, dominating the first set 6-2. The two grappled in the second set, as Ponwith narrowly took it 6-4. Ponwith pulled away in the third set, winning 6-3 to give him the match. The Big Green host the Dartmouth Invite from Friday through Sunday. The defending Ivy League champion women’s tennis took on Ivy foes Yale University, Harvard University and Columbia University at the Bulldog Invitational over the weekend. The weekend started off well against the Bulldogs, as the Big Green took two of four doubles matches and six of nine matches in singles. Saturday morning versus Harvard went even better, as Dartmouth won two of five doubles matches and a nearly perfect eight of nine singles matches. The team delegation of 10 wrapped up its tournament Sunday against Columbia with a slightly more challenging day. Dartmouth took half of the matches, including two doubles and four singles victories. Throughout the weekend, Dartmouth mixed and matched on the doubles court, Kristina Mathis ’18, Jasmine Abidi ’21, Catherine Cable ’20 and Maddie Hwang ’21 each won two doubles matches on the weekend. Every member of the team played singles as well. Abigail Chiu ’21 and Allison McCann ’20 went undefeated in their three singles matches. On Oct. 18th, the team heads to University of Pennsylvania for the ITA Northeast Regional Championship. In Philadelphia on Saturday, the Big Green lost 3-0 to the University of Pennsylvania, ending its two-game win streak. Dartmouth falls to 4-6 overall and 1-2 in conference play. Penn got its first goal on goalkeeper Hailey Valerio ’19 just under nine minutes into the game, a tip-in from the near post. The game remained contested for the rest of the first half as neither team was able to find the back of the net. But the Quakers came out firing in the second half, scoring two goals within the first 15 minutes to put the team at a 3-0 disadvantage. Carmen Braceras ’20 and Lia Constantine ’21 ­— who earned Ivy League Rookie of the Week honors for her performance against Fairfield University and Brown University last week — each recorded three shots toward a total of 14 by the Big Green. Valerio made nine saves in the losing effort. This weekend, the team takes on Yale University on the road and hosts Providence University. Drew Hunnicutt ’19 hauled in a fourth-down touchdown pass from Jack Heneghan ’18 with 34 seconds on the clock, leading a near-miraculous 28-27 comeback win over Yale University on homecoming weekend. After the Big Green had looked buried early on, with little offensive motion and a 21-0 deficit, Hunnicutt’s catch capped off the largest comeback in program history. Despite a 47-yard pick-six from cornerback Isiah Swann ’20, Dartmouth entered the second half down 24-7. Strong defense on both ends had Dartmouth behind 27-14 over halfway through the fourth quarter, when the Big Green’s hopes were salvaged by a fourth-down roughing-the-passer penalty on Yale. Heneghan capitalized on the Yale mistake, hitting running back Ryder Stone ’18 with a 30-yard pass and then finding Dylan Mellor ’19, who had 133 yards on the day, for a 40-yard touchdown. The defense held strong on the ensuing Yale possession, giving Dartmouth one last chance down 27-21 with 4:24 to go. With the clock ticking down, Dartmouth marched toward the end zone, buoyed by a key fourth-down conversion and Heneghan’s three carries for 32 yards. After Hunnicutt’s desperation touchdown catch, David Smith ’18 nailed home the game-winning extra point and the Big Green held on to complete the homecoming comeback. Heneghan converted 24 of 42 throws for 314 yards on the day, marking his fifth career 300-yard game. This is the third-straight week Dartmouth has won a game in the final minute of the fourth quarter or overtime. The victory keeps Dartmouth’s undefeated season alive while giving the Bulldogs their first loss of the year. Next weekend, the Big Green looks to continue its incredible run at Sacred Heart University on Saturday at 1 p.m.
Men’s and women’s cross country sent teams to compete at the New England Championships at Franklin Park in Boston, Massachusetts on Saturday. The men finished fifth with 192 points while the women were ninth with 196 points. Will Shafer ’18 led the way with a strong third-place finish, completing the 8-kilometer course in 25:27.0. His strong finish garnered him All-New England honors. Owen Ritz ’21 and Marco Pompilj ’19 finished together in 33rd and 35th places, with times of 26:03.2 and 26:05.2, respectively. Rounding out the scoring runners were Nick Feffer ’21 in 45th (26:15.9) and Reed Horton ’19 in 76th (26:46.9). The women’s team was led by Abby Brazil ’21, who placed 15th in 18:25.1 over the 5K course to earn All-New England honors. The next three Big Green athletes finished within seven seconds of each other, with Meg Tuthill ’20 in 26th (18:40.63), Claire Dougherty ’20 in 30th (18:46.81) and Rachel Ludwikowski ’21 in 31st (18:46.85). The final athlete to score was Grace Thompson ’19, who finished in 94th in 19:43.93. The cross-country teams return to action next week with the men competing at the NCAA Pre-National Meet in Louisville, Kentucky on Saturday, while the women compete at the Penn State Invitational at State College, Pennsylvania on Friday. The Big Green (7-2-1, 2-0-1 Ivy) downed Hofstra University 3-0 on Tuesday before taking a 2-2 draw at Yale University on Saturday. The Bulldog comeback put the brakes on a seven-game Dartmouth win streak which began Sept. 4. Wyatt Omsberg ’18 opened up the scoring against Hofstra with his fourth goal of the season, this one on a penalty kick in the 57th minute. The Big Green kept the momentum going and added two more goals before the 70-minute mark. Noah Paravicini ’19 scored in the 62nd minute on an assist from Matt Danilack ’18 and Tyler Dowse ’18. Next, it was Ivy League Player of the Week Justin Donawa ’19 who hammered in a shot from the right side of the box off Danilack’s second assist of the game. Dartmouth recorded eight shots and goalkeeper Christopher Palacios ’21 had one save on seven Hofstra shots. At Yale on Saturday, Dartmouth scored twice in the first half to pick up a 2-0 lead. Eduvie Ikoba ’19 scored at the 11th minute off an assist from Paravicini and Zach Kalk ’20. He struck again in the 23rd minute, taking a cross from Dawson McCartney ’21 and scoring on a wide-open shot. Despite the Big Green’s strong start, the Bulldogs answered back with two goals in the second half, forcing the game into overtime with 40 seconds left. 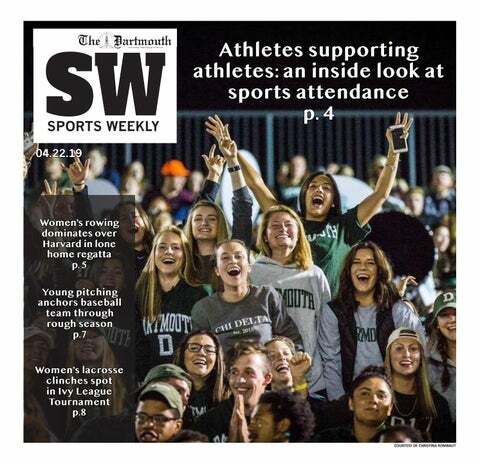 Dartmouth had a pair of shots in the first overtime period, but neither team could score and the game ended as Dartmouth’s first draw of the season. This weekend, the team will travel to the University of Pennsylvania in hopes of preserving its place near the top of the Ivy League standings. The past week was a mixed bag for the women’s soccer team (5-6-0, 0-3-0 Ivy),which got a home win against the University of Massachusetts Lowell before losing at Yale University. At home on Monday, the Big Green won 2-0 against the River Hawks. Bonnie Shea ’21 recorded her first goal of the season just under 25 minutes into the match on a corner from senior Brittany Champagne ’18. Remy Borinsky ’19 doubled Dartmouth’s advantage with a goal at the 38-minute mark. Bianca Ribi ’18 and Lauren Lucas ’19 were credited with the assist. Dartmouth totaled 11 shots on goal while holding UMass Lowell to only one. The win was the third clean sheet of Mariel Gordon ’21’s college career. The team looked to post its first Ivy League win against Yale University but fell 2-1 in a hard-fought overtime loss. The Bulldogs scored their first goal at the 53:41 mark, but a goal from Shea evened things up in the 61st minute. None of the 14 other second-period shots found the back of the net, taking the game to overtime, where Yale struck in the final minute period. Ribi had six shots and Borinsky had four, while Gordon recorded four saves. Dartmouth remains in last place in the Ivy League. Dartmouth lost a pair of close matches at Princeton University and the University of Pennsylvania, bringing its record to 6-8 overall this season and 2-3 in the Ivy League. Facing the Tigers on Friday, the Big Green came back from a 7-2 deficit to win the first set 26-24. After losing the second and third sets 25-19 and 25-14, Dartmouth found itself in a hole again in the fourth set. The Big Green came as close as 12-9, but the final set was lost 25-18 on a Princeton kill. Overall, Sara Lindquist ’18 recorded 10 kills on 26 total attempts, Douglas had 12 digs and Tori Dozier ’20 set up 30 assists. The road trip ended with a 3-1 loss to Penn. Lindquist and Mallen Bischoff ’21 recorded 14 and 11 kills apiece, while Dozier had a double-double with 14 digs and 38 assists. Dartmouth took a 7-4 lead early into the first set before Penn regained momentum to win 25-19. The visitors took another early lead in the second set, but this time the Big Green eked out a 25-23 win with the help of an important kill by Olympia Nagel-Caland ’21. Dartmouth dropped the third set 25-18 but kept the fourth set close all the way to the end, as neither team gained more than a two-point advantage during the entire set. Even though Dartmouth evened things up 20-20 with several points from Bischoff, the Quakers pulled out the 25-23 win. This weekend, Dartmouth hosts Yale University and Brown University.